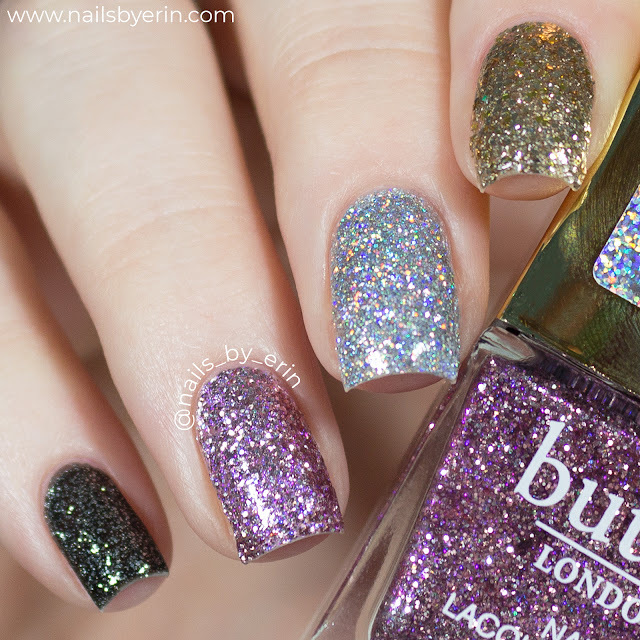 Today I have a swatch and review for the butter London Peel-Off Glitter Collection. I love using glitter in my nail art, but I have to admit.... Scrubbing off glitter with acetone and trying to get every speck of glitter off my nails and cuticles after a nail art design is a bit of a hassle. When butter London reached out to me about this collection, I was so excited! It sounded like the perfect solution for me. Keep on reading to hear what I thought of these polishes and to see my swatch photos/my live swatch video! For my video, the 4 polishes I used (from left to right) are Black Magic, Glitz, Supernova, and Gold Rush. I use glitter in so many of my nail art designs but it is annoying when I have to scrub off the glitter on my nails when I'm removing it. The glitter never comes off easily. But these were so easy to remove! I was really impressed. 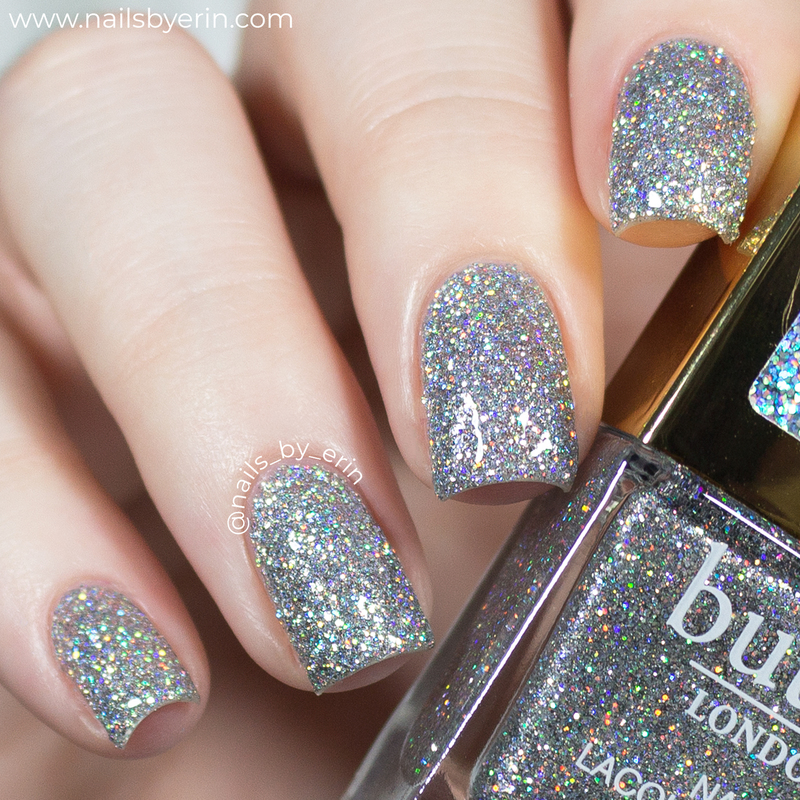 To apply them, you paint the glitter straight onto your nail (no base coat) until you're happy with the glitter payoff. I also applied top coat for that extra shine. When the nail polish is completely dry, it will easily peel off with an orange woodstick or if you get a nail under the top of the cuticle area! I was able to peel off every nail within a few seconds. But I also really wanted to do a little test for the durability of these polishes. While wearing these four nails, I washed dishes, did laundry, picked up around my room, etc. I wanted to see if some general tasks would make these pop off easily. Luckily, I had no problems and none of the nails started to peel or pop off! One thing to note: since these are peel-off nail polishes, they do have a thicker consistency. I didn't have too much trouble applying them, but I imagine that someone new to nail art might find this a little harder. Just make sure you don't have too much polish on the brush and you should be fine! 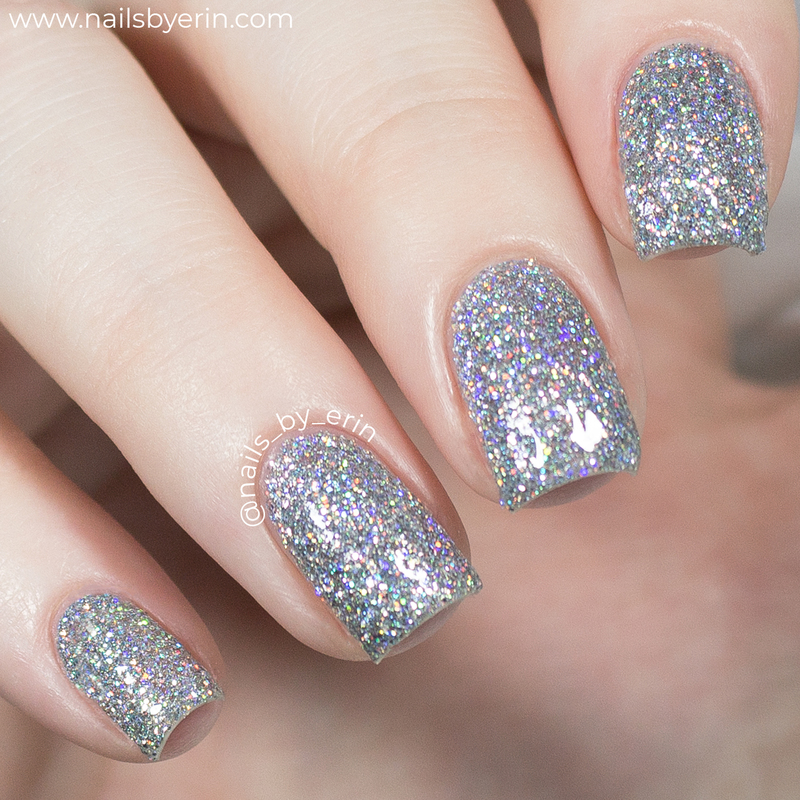 I also did a solo swatch of "Supernova", the holographic silver glitter polish. I love this one!! You guys know that so many of my manis include holographic silver glitter so I definitely see myself using this polish in the future. I think this is my favorite out of all the polishes! DISCLAIMER: These polishes were sent to me by butter London for review. All opinions expressed on these products are my own. Some links are affiliate links.